At its core, Overwatch may be all about teamwork, fast-paced gameplay and competitive arena combat, but Blizzard knows fans have taken a liking to piecing together the lore surrounding its shooter. From subtle in-game hints to comics and teasers, there’s certainly no shortage of material for fans to digest and add to a growing timeline of events, with each morsel of information released by the developer a potential teaser for upcoming content. The rabbit hole appears to have deepened today, as Blizzard has released a new batch of images that offer insight into the events that befell the off-world Horizon Lunar Colony. Detailed through a series of emails exchanged between scientists living on the colony, it appears as if the facility’s human population was conducting experiments on a group of gorillas before communication went dark. 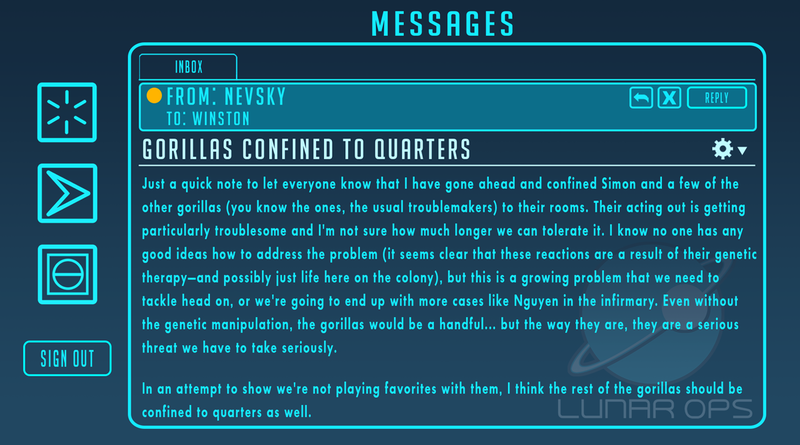 You can check out the correspondence for yourselves below, which make mention of playable character Winston’s mentor, as well as a critical emergency that occurred on the facility. Interestingly, one of the emails makes mention of Hammond, a gorilla that had escaped confinement and been on the run for a week, leading many to speculate that he may, like Winston, be another highly intelligent primate that escaped the facility before the uprising that resulted in the scientists’ deaths. There is, of course, every chance that Hammond was the initiator of the attack, which would make for an interesting hero addition and a personal enemy, of sorts, for Winston. We’ll have to see what Blizzard has planned, but if members of the Overwatch team are headed to Luna in order to unearth the truth, it’s looking likely that it will form the basis of a new map, perhaps leading to the discovery that Hammond is now its leader. We can probably expect Blizzard to elaborate on what this all means in the near future, but in the meantime, there’s already plenty going on in-game to keep players occupied. Overwatch‘s Anniversary Event, which adds new Legendary skins and four new arena maps, is currently ongoing and ends June 12. See all the details here.